Offworld, according to the project’s website, is “a single player, third person shooter where players pilot an airship and fight for the dominion of their chosen clan!”. It sounds like a simple concept, and it is, but what surprised me is just how much fun this game can be! Usually I prefer to review games which are open source (Offworld appears to be proprietary), but this game is cross-platform and offered as a generous “pay what you will” product. I feel that arrangement is liberal enough to merit a review. 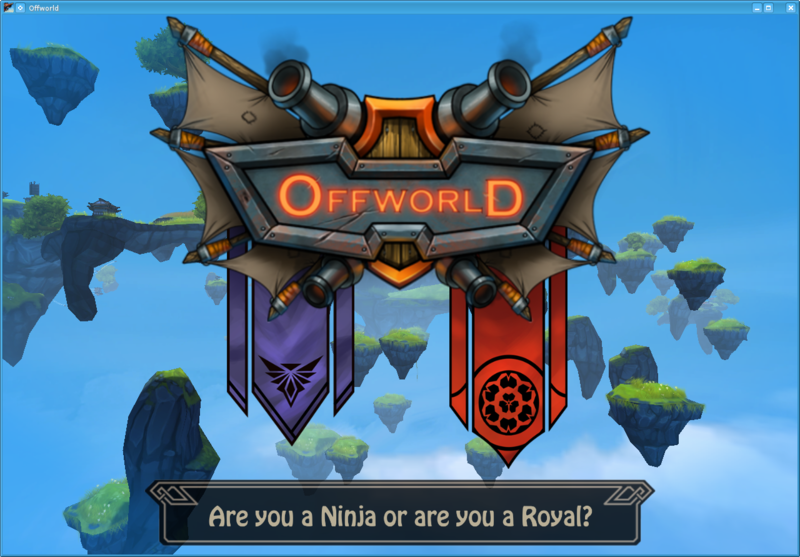 The basic concept of Offworld is that we are piloting an airship for one of two rival clans. At the beginning of a match we choose which clam we wish to fight for and we are set loose in a large, 3-D sky. Both clans have dozens of airships in the sky and it is our mission to kill off as many of the enemy aircraft as possible while dying as little as possible. Seems straight forward enough. We mostly pilot the ship and fire weapons using the mouse and we can adjust our ship’s throttle with the keyboard. 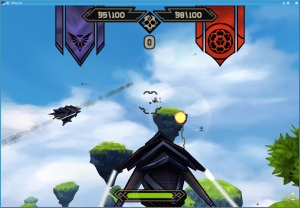 Both clans have two types of airships. One ship is heavy, armoured and slow. The other ship is small, fast and fragile. Each ship can be outfitted with a few different weapons if we wish, but customization is kept at a minimum in this game. Offworld keeps things simple. As in, pick your side and go join in the giant dogfight in the open arena! It is this simplicity which makes Offworld so easy to pick up and play. There doesn’t appear to be any user manual or documentation — it isn’t needed. There were a few things which kept me playing Offworld once I got the hang of the basic controls and started blowing away enemies. One is that the game can be surprisingly difficult to master. Oh, it is easy enough to figure out the controls, but with an open arena and dozens of other airships flying around it is difficult to live long enough to form strategies. Any attempt to simply look around the map (which is populated by floating bits of land you should avoid crashing into) is going to get you shot. Any attempt to go blazing headlong into the enemy fleet is likewise going to get you shot in a hurry. If you want to get a good kill:die ratio going you need to pick your battles, be aware of enemies firing at you and avoid flying too close to the ground-based enemy guns. The action is quick and, chances are, the player will be destroyed and respawn half a dozen times over the course of the battle. After a while the game tallies up the kills and declares a winner. The player, I found, has an influence over the battle, but is not the only deciding factor. In some games I played fairly well and my side still lost. Other times I did poorly and was declared victor. However, I did find that the better I played the more likely my side was to win, so the player is a key force in the game. Offworld is not only fun and fast paced, it is pretty too. The artwork may appear simple, but I really enjoyed the design of the various airships and the ground structures. The open, blue sky is an attractive background for the massive melee and I found the environment pleasant. The controls are fairly smooth and easy to learn, which is nice too. All in all, I really had fun with Offworld and didn’t find anything in the game about which to complain. I do feel Offworld is missing a multi-player option. This sort of massive, respawning sky battle just begs for a multi-player addition in future versions and I hope it is added. This game, while fun against AI opponents, would be amazing at a LAN party.